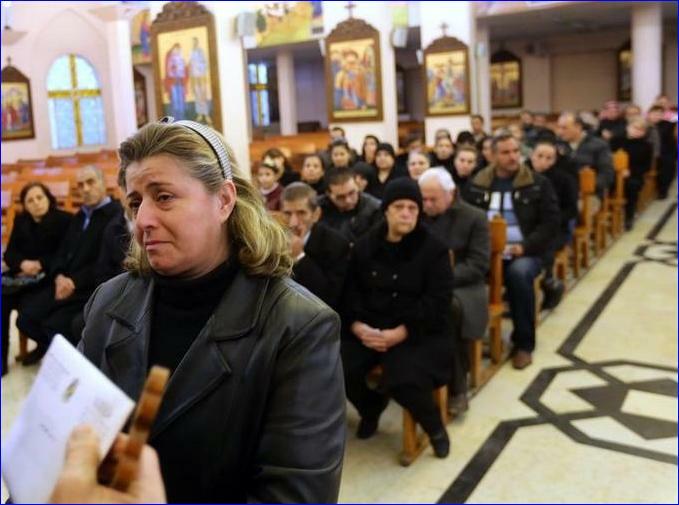 The Chaldean Catholic bishop in Aleppo penned an emotional op-ed on Sunday describing the “mortal threat” to Christianity he says his country, now ravaged by three years of civil war, faces. Syrian people from the Christian town of Maalula, a symbol of the ancient Christian presence in Syria which is currently under control of Syrian rebels, including jihadist groups, attend a mass service at the Saint Joseph church on December 18, 2013 in Damascus (Photo: Louai Beshara/AFP/Getty). “Aleppo, where I have been bishop for 25 years, is devastated. We have become accustomed to the daily dose of death and destruction, but living in such uncertainty and fear exhausts the body and the mind,” Audo wrote. Though Aleppo has 45 churches and “Syria was one of the last remaining strongholds for Christianity in the Middle East,” the bishop explained that most Christians who can afford to have left Syria. Besides the fear of bombs, unemployment, lack of food and electricity compound the worries for those who have remained. On a personal note, the bishop said, “I have to be careful walking around the city because of the risk of snipers and kidnappings” as two priests were kidnapped on the road from Aleppo to Damascus. Besides his work as bishop of Aleppo, Audo heads the Catholic aid charity Caritas which coordinates emergency food and medical aid for those of all faiths.